The modern-day dentistry is focused on esthetics, which is one of the prime concerns in pediatric patients. Discoloration of the anterior teeth in young permanent dentition is common due to many developmental defects. Dental fluorosis can be observed as white opacities, brown spots, or streaks, with superficial enamel defects, pitting, or mottling depending on the severity. It can affect the anterior teeth and sometimes complete dentition. For esthetic management of mild-to-moderate fluorosis stains, enamel microabrasion is preferred which is a minimally invasive procedure.,, Microabrasion involves mild acid etching and application of an abrasive medium., The use of 18% hydrochloric acid (Croll) and 35% phosphoric acid (Kamp) is recommended with pumice slurry. In young patients, an important aspect of enamel microabrasion is that it eliminates the need for enamel reduction with burs (which is mandatory for veneering or laminates). It was also suggested that topical application of remineralizing agent or fluoridated toothpaste could have beneficial effects. The remineralizing agent casein phosphopeptide–amorphous calcium phosphate (CPP-ACP) provides high concentration of calcium and phosphate ions which maintains a supersaturated mineral environment. This environment helps in reducing demineralization and aids in remineralization of enamel. The combination of enamel microabrasion with CPP-ACP is helpful in maintaining the stability of the results achieved. Hence, in the present case, microabrasion with CPP-ACP cream (GC Mousse) is used to treat discolored anterior teeth. 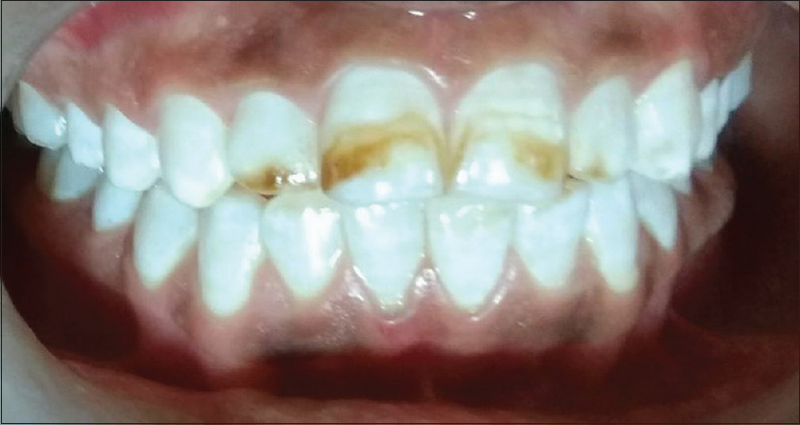 A 12-year-old male patient reported to the department of pedodontics and preventive dentistry with a complaint of noticeable yellowish-brown stains on his front teeth. His history revealed that he was resident of the area having endemic fluorosis. He was hesitant in talking or smiling due to unesthetic appearance of his teeth [Figure 1]. The parents were also concerned for the same. According to Dean's fluorosis index, the stains were diagnosed as moderate fluorosis. As the patient was younger, so minimal invasive treatment had to be chosen to prevent any tooth structure loss, so enamel microabrasion followed by remineralizing agent was preferred over veneers and laminates. The treatment plan, sequence of the treatment with the required number of visits, and possible outcomes were explained to the parents, and a written consent was obtained for the same. In the first step, scaling was done, and the teeth were prepared with the pumice slurry and rubber cup with a slow-speed handpiece. This was followed by isolation with rubber dam. In the second step, stained enamel surface was acid etched for 30 s followed by rubbing with a mixture of pumice and 37% phosphoric acid using rubber cup for another 30 s. The third step involved polishing with fluoridated prophylactic paste followed by rinsing and drying [Figure 2]. Then, CPP-ACP cream (GC Tooth Mousse) was applied to the treated tooth surface for 4 min. The patient was advised for home application of GC Tooth Mousse thrice daily for 2 weeks. In the consecutive sittings scheduled after 2 weeks, the same procedure was performed [Figure 3]. The patient did not report any postoperative sensitivity in subsequent visits. The patient and his parents were happy, and the patient did not have any complaints/complications during or after the treatment [Figure 4], after 10 weeks of treatment]. For better results, microabrasion can be used with bleaching technique in severe cases. Microabrasion technique (with proper considerations, adjuncted with remineralizing agents or bleaching, or the use of composite resin) results in improved esthetics and color uniformity of the teeth, restoring the patient's esthetics and self-esteem. It can be concluded that microabrasion along with remineralizing agents is an effective, noninvasive treatment for fluorosis stains. The authors certify that they have obtained all appropriate patient consent forms. In the form, the patient(s) has/have given his/her/their consent for his/her/their images, and other clinical information to be reported in the journal. The patients understand that their names and initials will not be published and due efforts will be made to conceal their identity, but anonymity cannot be guaranteed. Sundfeld RH, Franco LM, Gonçalves RS, de Alexandre RS, Machado LS, Neto DS, et al. 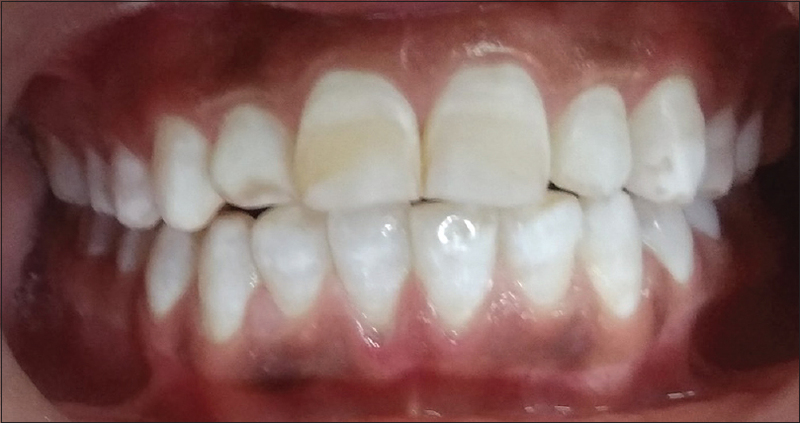 Accomplishing esthetics using enamel microabrasion and bleaching-a case report. Oper Dent 2014;39:223-7. Schmidlin PR, Göhring TN, Schug J, Lutz F. Histological, morphological, profilometric and optical changes of human tooth enamel after microabrasion. Am J Dent 2003;16:4A-8A. Croll TP. Enamel microabrasion: The technique. Quintessence Int 1989;20:395-400. McCloskey RJ. A technique for removal of fluorosis stains. J Am Dent Assoc 1984;109:63-4. Croll TP. Enamel microabrasion: Observations after 10 years. J Am Dent Assoc 1997;128 Suppl:45S-50S. Kamp AA. Removal of white spot lesions by controlled acid-pumice abrasion. J Clin Orthod 1989;23:690-3. Deshpande AN, Joshi NH, Pradhan NR, Raol RY. Microabrasion-remineralization (MAb-re): An innovative approach for dental fluorosis. J Indian Soc Pedod Prev Dent 2017;35:384-7.
de Vasconcelos AA, Cunha AG, Borges BC, Vitoriano Jde O, Alves-Júnior C, Machado CT, et al. Enamel properties after tooth bleaching with hydrogen/carbamide peroxides in association with a CPP-ACP paste. Acta Odontol Scand 2012;70:337-43. Sundfeld RH, Sundfeld-Neto D, Machado LS, Franco LM, Fagundes TC, Briso AL, et al. Microabrasion in tooth enamel discoloration defects: Three cases with long-term follow-ups. J Appl Oral Sci 2014;22:347-54. Celik EU, Yildiz G, Yazkan B. Clinical evaluation of enamel microabrasion for the aesthetic management of mild-to-severe dental fluorosis. J Esthet Restor Dent 2013;25:422-30. Sundfeld RH, Croll TP, Briso AL, de Alexandre RS, Sundfeld Neto D. Considerations about enamel microabrasion after 18 years. Am J Dent 2007;20:67-72. Castro KS, Ferreira AC, Duarte RM, Sampaio FC, Meireles SS. Acceptability, efficacy and safety of two treatment protocols for dental fluorosis: A randomized clinical trial. J Dent 2014;42:938-44.